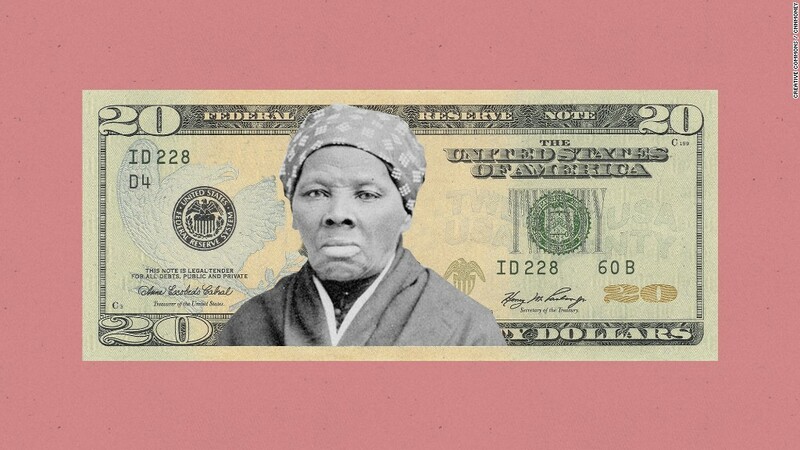 Harriet Tubman's fate on the $20 bill may not be as certain as we once thought. Treasury Secretary Steve Mnuchin told CNBC that Tubman's placement on the bill is "not something that I'm focused on at the moment." According to Doug Mudd, museum director and curator at the Edward C. Rochette Money Museum, women have appeared on U.S. currency before: Martha Washington on silver certificates in the 1880s; the Sacagawea and Susan B. Anthony coins, minted in the 20th and 21st centuries; and Lady Liberty and other allegorical depictions of women throughout time. But never on modern U.S. dollar bills. Ever since U.S. money became a world currency after World War I, the design has stayed the same, featuring the same historical figures -- almost entirely male. U.S. Bureau of Engraving and Printing spokesperson Linda Washington told CNNMoney that the bureau has "not received any instructions to change our present course." But U.S. currency is already far behind other countries when it comes to putting women on paper money. In Sweden, three different banknotes feature female historical figures, and in Australia, women and men share sides of the paper bills. "Most world money reflects current times much better than the U.S. money," Mudd says. "Since we're having to change the designs on the notes and to modify them and improve their security, why not change the designs to reflect current American culture and society and ideas? Because that's what the rest of the world is doing." Australia's depictions of women on banknotes is quite ingenious: each note features both a man and a woman on opposite sides of the bill. Dame Mary Gilmore appears on the 10 pound note, Mary Reibey on the 20, Edith Cowan on the 50 and Dame Nellie Melba on the 100. Each woman made her own mark on Australian history. Gilmore made history as an activist and social reformer. She also wrote poetry about the Australian landscape, including a verse featured beside her portrait on the banknote. In 1811, Reibey took over her husband's businesses after his death, becoming one of the most successful leaders in the Australian business world. Cowan became the first female member of the Australian Parliament in 1921. Melba was an Opera soprano, renowned for her roles as Mimi in La Boheme and Gilda in Rigoletto (fun fact: melba toast and Peach melba are both named for this legendary singer). The country's krona notes feature three women: children's writer Astrid Lingen on the 20, actress Greta Garbo on the 100 and singer Birgitt Nilsson on the 500. On the reverse of each note, you see the woman's birthplace: fine-lined depictions of Småland, Stockholm and Skåne, respectively. The $10 note in New Zealand commemorates Kate Sheppard, a women's rights advocate who fought for the right to vote. After moving to New Zealand in the 1870s and working two decades for women's rights (including organizing a petition signed by more than 32,000 women), Sheppard saw New Zealand pass the Electoral Act of 1893, making it the first country in the world to grant universal suffrage. On the New Zealand banknote, Sheppard's face appears alongside a white camellia, a flower that came to symbolize the fight for the women's vote. 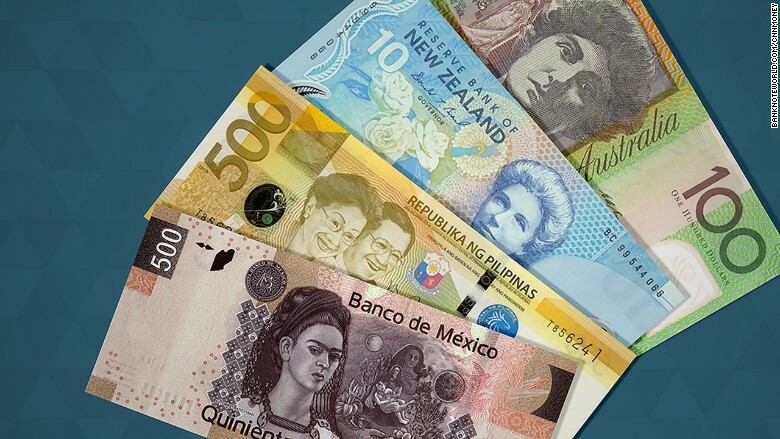 In Mexico, two women appear on banknotes: artist Frida Kahlo on the 500 peso note and writer Sor Juana Inés de la Cruz on the 200 peso note. De la Cruz made history as a writer, but she first came to Mexico as a child prodigy, renowned for her natural aptitude for learning languages. In 1667, she entered a convent to devote her life to scholarship, and at the time of her death in 1695, she'd assembled an incredible collection of books in Mexico City, containing more than 4,000 tomes on topics ranging from theology to art to science. Her banknote includes symbols of this success, including a small inkwell, two pens and a library window. Frida Kahlo shares the 500 peso note with her husband, fellow artist Diego Rivera. Kahlo's self-portrait is on one side, beside a miniature work of her art, "Love's embrace of the Universe, Earth (Mexico), I, Diego, and Mr. Xolotl." The painting depicts two clasped hands, a Mother Nature figure, a desert landscape and a version of Rivera cradled in Kahlo's arms. The artists' torrid romance is now the stuff of legend, as are Kahlo's famously surreal paintings. Rivera appears on the note's reverse side, accompanied by a tiny replica of one of his murals. In 2012, on the 60th anniversary of the death of former First Lady Eva Perón, then-Argentinian president Christina Fernandez de Kirchner announced the new design for the country's 100 peso note, featuring the famous figure. "It's not that Eva was perfect or a saint, quite the opposite," she said. "What made her into something greater, more unforgettable and immortal is that she was a humble woman of the people who had the great luck to meet a man and a people." The Philippines honors its first female president, Corazon C. Aquino, on its 500-piso banknote, alongside a portrait of her husband, prominent politician Benigno Simeon Aquino, Jr. Just three years after her husband was assassinated in 1983, Corazon Aquino ran for office against Ferdinand Marcos, the country's long-time ruler. After massive demonstrations and allegations of election fraud, Marcos fled the country, and Aquino became president. Beside the portraits of Aquino and her husband is a depiction of the EDSA Revolution, the Epifanio de los Santos Avenue in Manila, site of demonstrations in 1986.